With the various vision functionalities and simple, intuitive programming environment of the TM collaborative robots, we will further enable safe, flexible, and collaborative manufacturing between human and machine. Our TM series provides a unique solution to easily install a robot to automate applications such as assembly, pick&place and inspection. As part of the TM series launch, we will release a “mobile-compatible” model which will seamlessly integrate into our market leading LD series autonomous mobile robot. This enables users to automate more complex tasks such as pick and place onto a tray or container, and to connect processes with autonomous mobile robots. We will introduce 12 robots in the TM series with a combination of the following specifications. Intuitive programming interface reduces programming time: Reduced installation and setup times compared to traditional industrial robots. The flowchart-based intuitive programming interface and easy teaching requires little to no previous robot programming experience. 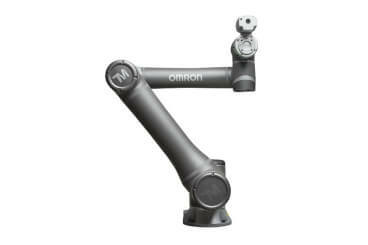 Integrated on-arm vision system reduces setup time: The TM series comes with built-in vision and integrated lighting, allowing the user to capture products with a wide viewing angle. Equipped with image sensing functions such as pattern matching, bar code reading, and colour identification, this robot system makes inspection, measurement and sorting applications extremely easy to set up out of the box. With the addition of the TM series collaborative robot to our product line-up, we will further enable safe, flexible, and collaborative manufacturing between human and machine and continue to accelerate "innovative-Automation", an innovative manufacturing concept where humans and machines work in harmony.